Lab suppliers interested in life science marketing opportunities in Texas may want to take note of Biotechnology Calendar, Inc. life science marketing events in the region. Our Texas A&M University life science marketing event is the perfect opportunity to increase lab sales leads at Texas A&M University. Biotechnology Calendar, Inc.’s College Station BioResearch Product Faire™ Event will be held on the Texas A&M University campus on January 31st, 2014. Biotechnology Calendar, Inc. life science marketing events draw large crowds of researchers, lab managers, purchasing agents and post-docs because attendees know that they will learn about the latest and greatest equipment on the market at our shows. Researchers know that everyone from their lab is invited to attend, and registration is quick and easy. Our delicious catered lunches also offer a way for researchers to break bread with sales reps and discuss potential solutions to their problems in the lab. Lab suppliers value our events highly because we offer customizable life science marketing opportunities through our sponsorship packages, excellent customer service at our shows and a double-checked leads list with contact information for every attendee at a given show. Our university contacts and pre-show advertising also ensure that there is a large crowd of interested and engaged researchers at every event. At each show, we offer quarter-page, half-page and full-page spaces in our event program, which improve lab supply companies brand recognition at the event. Lab suppliers interested in life science marketing opportunities and increasing lab sales leads in Texas may also be interested in recent funding statistics at Texas A&M University. Texas A&M received $42.2 million from the NIH in 2012. In addition to receiving research funding from the NIH, Texas A&M University also received $15.8 million from the NSF in 2012. More NIH and NSF funding statistics on Texas A&M University, including a breakdown of NIH departmental funding at the university organized by department name, number of awards received and total funding awarded, can be found in our blog article $58M in Funding for Potential Lab Sales Leads at Texas A&M. Biotechnology Calendar, Inc. invites lab suppliers interested in life science marketing opportunities in Texas to attend our annual College Station BioResearch Product Faire™ Event held on the Texas A&M University campus on January 31st, 2014. 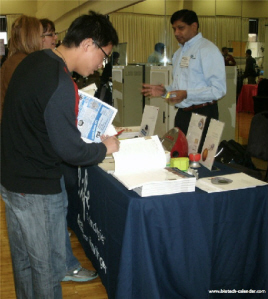 In 2012, the College Station BioResearch Product Faire™ Event attracted 128 attendees. Of the visitors, 22 were purchasing agents, professors and post docs, and 18 were lab managers. The attendees came from 33 different research buildings and 36 departments around campus. Biotechnology Calendar, Inc. is a full-service science research marketing and events-planning company that has been organizing life science marketing events at top research institutions nationwide for 20 years. If you are interested in working increase lab sales leads at universities closer to home, we encourage you to view our 2014 calendar of events. For more Texas A&M University research funding statistics, or to learn more about the College Station BioResearch Product Faire™ Event, click on the button below.